LAS VEGAS (AP) — Business developer and Republican presidential hopeful Donald Trump declared Saturday that the problem of illegal immigration needed to be solved but drew scattered groans when he suggested that a wall should be built along the U.S.-Mexico border. Speaking to a gathering of Libertarians in Las Vegas before headlining an event in Phoenix, Trump continued his blistering criticism of immigration policy. He repeated his charge that Mexico was sending violent offenders to the U.S. to harm Americans and that U.S. officials were being "dumb" in dealing with immigrants in the country illegally. "These people wreak havoc on our population," he said in a speech that was long on insults aimed at critics and short on solutions to the problems he cited. His apparently unscripted remarks were delivered to a few thousand people attending the Libertarian gathering Freedom Fest inside a Planet Hollywood ballroom on the Las Vegas Strip. Trump brought on stage Jamiel Shaw Sr., a Southern California man whose 17-year-old son was shot and killed in 2008 by a man in the country illegally. Shaw vividly described how his son was shot — in the head, stomach and hands while trying to block his face — and how he heard the gunshots as he talked to his son on the phone. Shaw said he trusted Trump, and encouraged the crowd to do the same. Trump's remarks about foreign policy included swipes at both President Barack Obama and GOP rival Jeb Bush. He said China and Russia were friends "because of incompetent leadership." He asked: "Who would you rather have negotiating with China? 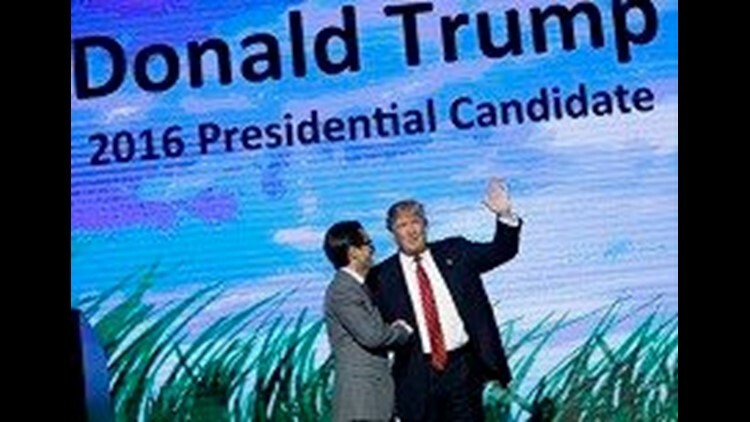 Trump negotiating with China or (Jeb) Bush negotiating with China?" When asked by an audience member about Russian relations, Trump said the problem is that Putin doesn't respect Obama. Trump's speech was filled with tangents and insults leveled at business partners such as Univision and NBC that have dropped him in the wake of his comments that Mexican immigrants bring drugs and crime to the U.S. and are rapists. He also directed familiar barbs at other presidential contenders, including Democrat Hillary Rodham Clinton ("the worst secretary of state in the history of the country"), news media figures ("lyin' Brian Williams") and Obama ("such a divisive person"). Nevada is 27 percent Hispanic and a key state for Republican candidates. The Freedom Fest conference bills itself as an egalitarian event for free-thinkers to discuss and celebrate liberty. A single protester standing outside the room where Trump spoke was more concerned about the businessman being tied to the Libertarian Party. "I've been a Libertarian for 43 years and Trump ain't no Libertarian," said Linda Rawles, who asserted that including Trump in Freedom Fest set back the party's movement. Later Saturday, Trump was scheduled to visit Arizona, a hub of immigrant and drug smuggling where the real estate developer and reality TV star has developed a large following. A rally in Phoenix was first planned at a posh resort that could handle about 1,000 guests, but organizers moved it to the city's convention center.